Tweaks database access via registry settings. Grants permission to run .Net applications from the shared folder. Adds required URLs to the IE Save Sites Zone. You'll need to run this utility after major updates, adding a new terminal, or changing servers or software folders or any time you get the Class Not Registered error. Each user session will need to run ETRegister.exe. This can be done with without elevated admin credentials since all it needs to do is add required URLs to the IE Safe Sites Zone, which resides in the registry in HKCU. 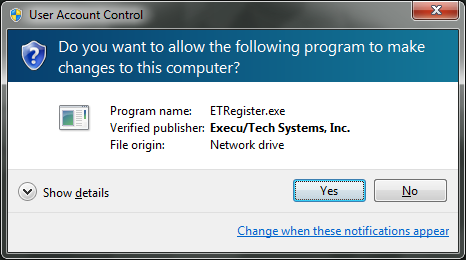 Each Windows user on the client computer will need to run ETRegister.exe. This can be done with without elevated admin credentials since all it needs to do is add required URLs to the IE Safe Sites Zone, which resides in the registry in HKCU. There are two methods to run this application. Select it from the File menu. You click File > Special > Register Programs and Controls. If you use a different style menu without this option, or nothing happens when you click on the option, try the second method. 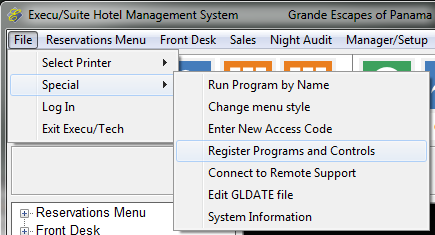 From the POS Administrator Menu you click System > Register Programs and Controls. *If your POS Administrator menu doesn't have this option, you're running an older version and must use the second method. 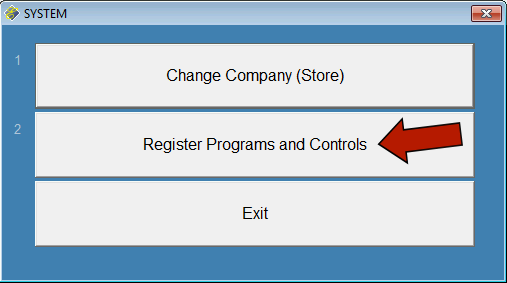 If nothing happens when you click "Register Programs and Controls", you must use the second method. Security settings are preventing the PMS or POS application from running it. Run this utility by browsing to the software folder on the server, right click it and select "Run As Administrator". 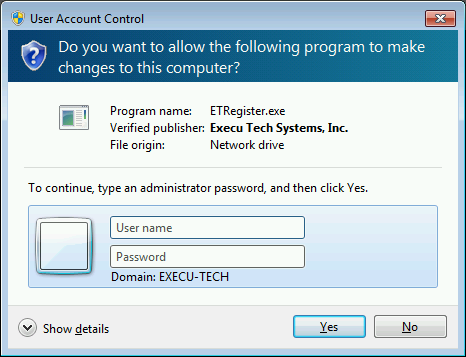 You may see a User Account Control prompt asking, "Do you want to allow this program to make changes on this computer?" This prompt appears because your an administrator but your User Account Controls (UAC) settings require elevated permissions. Click Yes to grant these permissions. This is the same as right clicking the application and selecting "Run As Administrator". 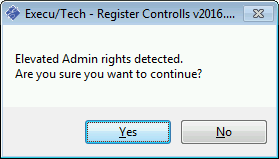 If your user isn't an administrator, the application will detect this and ask if you'd like to "Run As Administrator". This tells you that Administrator Credentials were not detected. This means that your Windows user is not an administrator. If you click the button "Run As Administrator", the application will restart with a request for elevated admin credentials. You will see a prompt asking to provide credentials and you can get these from your network administrator. We do not know your Windows user accounts and can't tell you what to enter here. Enter the necessary credentials and you'll see the following prompt letting you know you can proceed. Click "Yes" to continue. 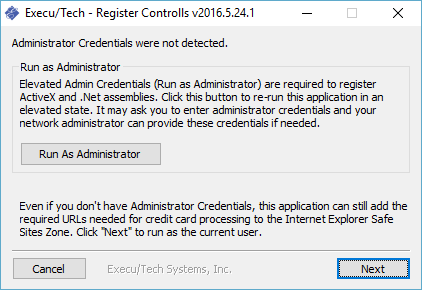 If ETRegister.exe only needs to be run as a non admin user (This is described at the top of the page.) then click "Next". You'll see the following prompt letting you know you can proceed. Click "Yes" to continue. If your user permissions allow it, you will see a window appear and begin scrolling through the controls and assemblies that are being registered. After a short time, you will be notified that a command window (black - like a DOS window) will appear and may need your input. Depending on your user settings, you may not have to provide input. If input is required, be sure to type Y. 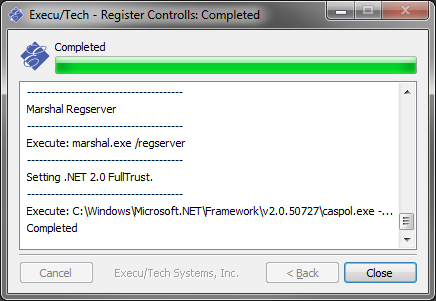 This allows Microsoft .NET applications to run from a network share. When the utility is finished, click Close.